This blog was initially created to document the process of creating a full pterosaur skeleton from rigid foam (XPS – Extruded Polystyrene Foam), which I called The Imaginary Pterosaur. It started on March 25, 2012 when I started making a replica of Guidraco venator, based on the fossil of the skull, described in January 2012, and fossils of its Brazilian relatives (which I used to make the body, since the body of the Guidraco has not yet been found). Ten months (February 5, 2013) later I started a new pterosaur: an Anhanguera and finished the skull in a week. On February 22 I started a Tupandactylus and on February 25, a speculative unnamed Dsungaripterid. In March and April I made a Tupuxuara, which won first prize in a paleoart contest, and was displayed at two international paleontological symposiums. Next projects include the full skeletons of a Tapejara, a Tropeognathus and a speculative “Nyctosaurus” lamegoi. 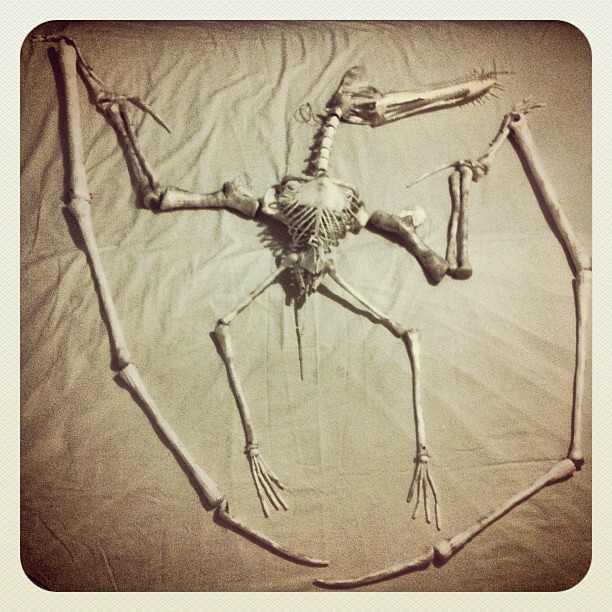 So now my goal is to discover how to create several pterosaurs, but not only skeletons, and not only using foam. I still have no idea where this is headed. When I started this project I knew nothing about pterosaurs or foam modelling. Well, I probably do know a bit now because of my research, but I learned it all from making these prehistoric animals. Only after making six models and two full skeletons I had the opportunity to analyse real fossils. The information I used for Guidraco were from articles, drawings and photos published in the Internet, in sites and blogs about palaeontology and pterosaurs, and from a great book on pterosaurs by Alexander Kellner. For the Anhanguera, Tupandactylus and the others I again used the Internet as a main source, but I also had access to academic papers with detailed photographs, descriptions and diagrams. Since Tupuxuara I have kindly received feedback, photos, articles, criticism and suggestions from several paleontologists. This has contributed immensely to the accuracy of these models. I always love to receive comments about this project. I am constantly researching to make the replicas as precise as possible, but if I don’t find the information, I invent it and keep on going since I can always fix it, replace a bone, make a new one, reposition, etc. The replicas are like scientific theories. I dig up a pterosaur from the internet, guess the missing parts, and fix them when I discover the correct way to do it. The exhibit “The Imaginary Pterosaur” (so far only featuring the Guidraco replica) has already been in four galleries and museums so far, all in Brazil. Tupuxuara leonardii and the other pterosaur skulls have been to international paleontology symposiums in Brazil. The Guidraco replica has also been in a videoclip of a São Paulo rock band (Mustache e os Apaches), and in a movie by brazilian director Beto Brant. The Imaginary Pterosaur project also has a Facebook fan page. The image above shows the Guidraco almost finished (all the bones, but still missing nails, connections and some fixes). Photo taken on May 5, 2012. The cover picture was taken in Campina Grande, Brazil on February 11, 2013, and shows Guidraco assembled in a flying position.